Heavy duty batteries for your renewable energy (RE) system! Solar-One batteries feature a design that’s so unique, it’s patented. Engineers at General Battery teamed up with Dupont chemists to design a flooded battery that is so dependable, it’s backed by the longest standard warranty in the RE industry (7 year free replacement and 3 year prorated). 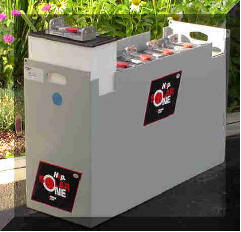 Solar-One batteries are very heavy and present special issues for the renewable energy installer. To put this superior technology to work for you, employees at General Battery designed an epoxy coated steel case that allows each 2 volt cell to be removed. This solved the weight issue and also offers excellent protection against breakage while in shipment. Oversized lead terminals are welded to the battery posts allowing the use of lead coated solid copper buss bars as the cell interconnects. Because the lead terminals are so large and heavy duty, they provide excellent conductivity and a strong connection point for the cell lifting strap. All these features mean fast and easy on-site assembly, great energy transfer and the ability to remove and replace individual 2 volt cells. The purchase of these batteries also includes an installation and maintenance manual written for the end user, and also the manufacturer’s written warranty. Solar-One batteries are warranted to deliver 2100 - 80% deep cycles and an estimated 4000 cycles at 50%, equaling more cycles and usable battery capacity. These offer a 10 year warranty - 7 year free replacement and 3 year prorated; these batteries have been in RE service for over 13 years, with a 99.8% track record in RE systems. These ship FREE to most commercial carriers with a dock anywhere in the lower 48 states (‘on the beaten path’). The Solar-One positive grid is the heaviest in the industry, allowing for the maximum amount of active material in each plate and increasing capacity. We have more specifications (and maintenance information) on these we can provide you regarding capacity and weight, so don’t hesitate to contact us for additional information; e-mail us at info@oasismontana.com. Battery prices have gone up more than 60% in the past nine months, due to the skyrocketing prices of lead; while we endeavor to keep our prices as current as possible, they are subject to change without notice, so please call to verify pricing.